3D Puzzle Rectangle - Dino Rentos Studios, INC. 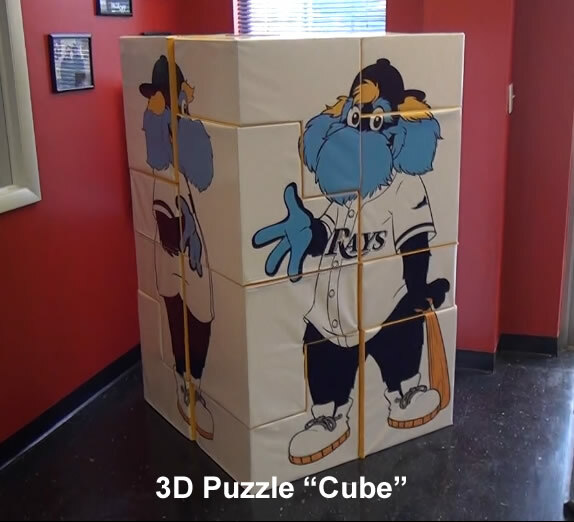 Check our our newest product, the 3D puzzle Cube! This is the perfect item to get your logo or message into the hands of your guests. This interactive prop is rigid foam filled and covered in a colored canvas of your choice along with vinyl canvas that has your custom logo or message. The perfect prop for timed events or just for fun. A total of 16 pieces makes the assembly by your guest fun and interactive! Order online and send us your graphic or call for more details. Allow 3-4 weeks for your custom build. Call to see if expidite services are available.